Unfortunately, this form of root rot is difficult to control or stop once it begins. It is best to prevent and minimize stress to your turfgrass as easily as possible to decrease potential damages. Use the following tips to enhance the health of your sod all summer and beyond. Minimize use of herbicides, especially on St. Augustine grass. If you aren’t sure how to address your diseased turf, call (813) 684-7336 to schedule an appointment with Green Solutions Lawn Care and Pest Control. The Tampa lawn care experts at Green Solutions will help you beautify and preserve your outdoor landscape, even in the face of Florida’s harsh weather. 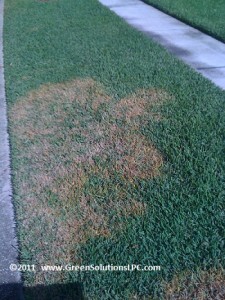 Share the post "Identifying Lawn Disease"